SEATTLE – On a cornerback blitz, Kyler Gordon broke free into the backfield, untouched and unseen by anyone on the offense. In a game situation, Gordon would have had free rein to blast the quarterback with a blind-side hit. This wasn’t a game. It was Day 10 of Washington’s fall camp, and the play happened during a two-hand-touch team period, and, well, everyone knows quarterbacks are never to be hit in practice anyway. So just before he would have hit freshman Colson Yankoff, Gordon got creative. He did an acrobatic somersault, landing near the feet of the startled QB (and still getting credit for a touch sack). 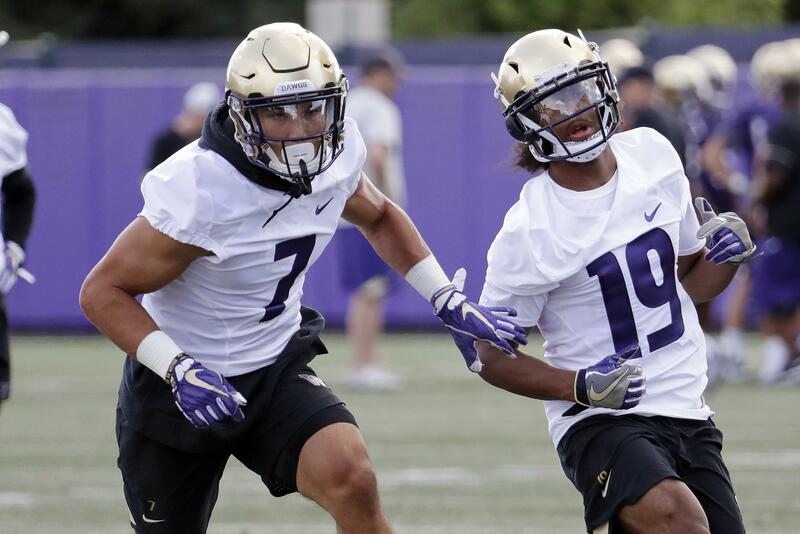 It was just the latest example of the prodigious athleticism – the age-defying stunts, if you will – Gordon and UW’s other freshman defensive backs have displayed in camp so far. So excited are the Huskies about the newest additions to the secondary that UW defensive coordinator Jimmy Lake was practically doing his own age-defying stunts – verbal cartwheels, mental backflips, if you will – while talking about them after practice Monday. In the past four seasons that Lake, a former North Central High and Eastern Washington standout, has directed the secondary, he hasn’t been shy about playing true freshmen. Budda Baker and Sidney Jones were starters as true freshmen in 2014; Jordan Miller saw time as a rookie in 2015; Taylor Rapp took over as a starting safety in 2016; and all three true freshmen defensive backs last year (Brandon McKinney, Elijah Molden and Keith Taylor) were key special-teams contributors. Gordon, Dominique Hampton and Julius Irvin could be next in line, even when it appears there is no obvious spot – no apparent weakness – for them in a secondary that the Huskies believe is the best in the country. “Every single year, dating back to Budda and Sidney, and then we go all the way Elijah Molden, all of our young guys have played a lot of football,” Lake said. “I think those three freshmen right now – we’re so excited about them in terms of their athleticism, their speed, their smarts. Now we’ve still got to make a lot of decisions as we go forward whether they play or they don’t play. Irvin, a 6-foot-1, 183-pound freshman from Anaheim, Calif., spent Monday as the left cornerback with the No. 2 defense. During one team period, he broke up a Jake Haener pass on the perimeter – nearly hauling in an interception that would have been an easy pick six. Gordon, the 6-foot cornerback out of Archbishop Murphy, and the 6-2 Hampton (Glendale, Ariz.) have been regulars with the No. 3 defense. “I’m telling you right now, if you go back three years, when me, Austin (Joyner) and Dustin Bush first got here, we looked nothing like they do. We looked like chickens with our heads cut off running around. They’re playing like they’ve been starting,” Miller, now a starting senior cornerback, told reporters last week. Published: Aug. 15, 2018, 5:02 p.m. Updated: Aug. 15, 2018, 7:16 p.m.